In early spring of 2017, a meth lab exploded in an abandoned fire tower in Rapid City, South Dakota. First responders were met with the chaos of a chemical explosion. The scene was anything but secure. Fights broke out, and some individuals had guns. Victims suffered injuries from the explosion and other drug-induced conditions. Nerves and excitement were high for nearby Western Dakota Technical students and their mentors. On this day, the instructors were dedicated to ensuring that their group of health science students gained hands-on experience responding to a simulated meth lab explosion. They were better prepared than they knew. One “patient” named Caesar suffered lower leg amputation. Fire science students carefully transported him down two flights of stairs and out to the casualty collection point. From there, paramedic students immediately applied a tourniquet and began their patient assessment. In another scenario, a patient named Stan, or iStan, fell as he escaped down the stairs, hitting his head. Diagnosed with cervical trauma and a tension pneumothorax, iStan’s medical team used needle decompression and intubated him. The paramedic students also practiced head and neck stabilization. 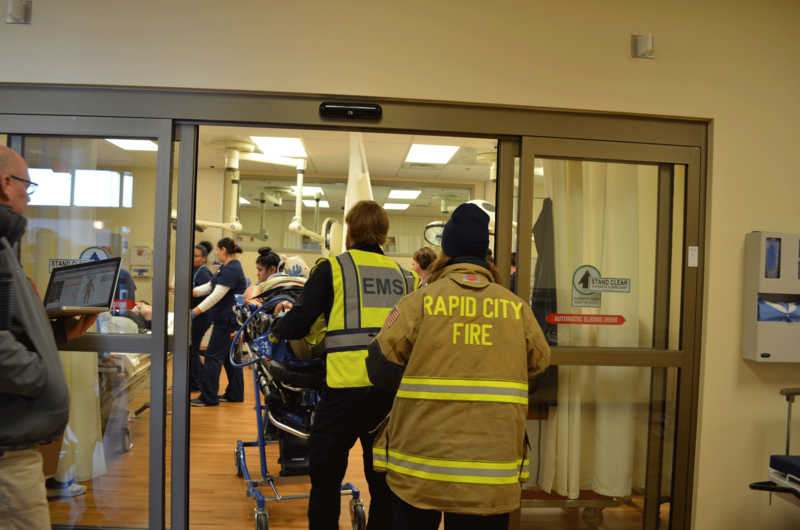 Rescued patients were transported to the new Medical Simulation Center at Western Dakota Tech for further triage and treatment. 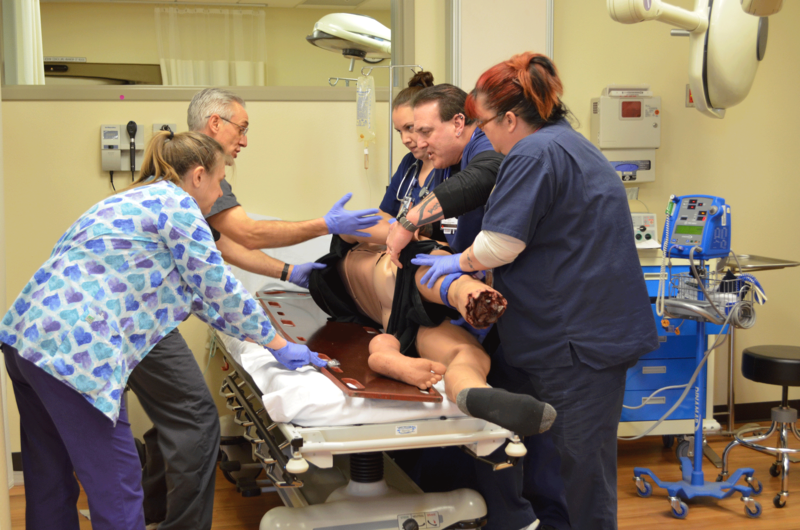 Supported by faculty from eight major programs and community first responders, the simulated mass casualty drill was the capstone event for 50 student participants. 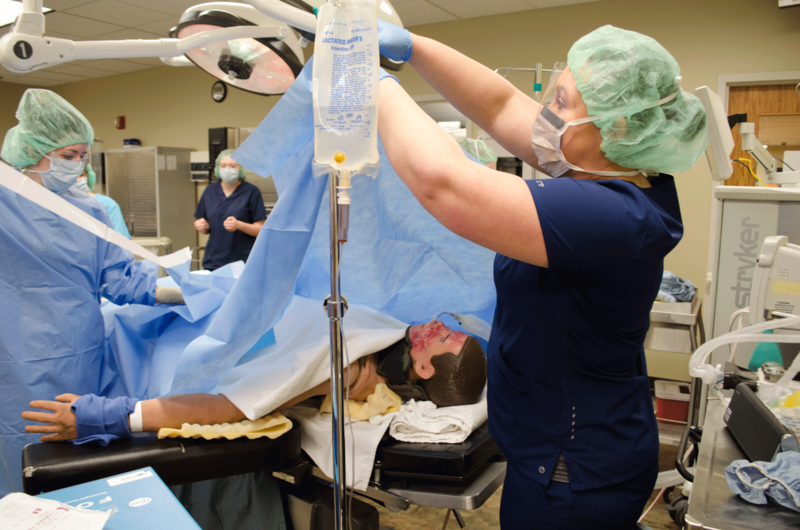 The interprofessional simulation drew students from Law Enforcement, Fire Science, Practical Nursing, Paramedic, Pharmacy Technician, Medical Laboratory Technician, Phlebotomy, Surgical Technology and Health Information Management. “This event, our Sim Rally, brings together all of our medical and emergency programs to work together in an interprofessional setting so that they’re ready to go day one in their specific field,” McNett said. McNett knows a thing or two about simulation. He served in the Air Force and trained air maintenance crews in a simulated aircraft. The scenarios are vetted against recognized standards, such as QSEN (Quality and Safety Education for Nurses) and use pre-hospital scenarios established by NREMT (National Registry of EMTs), NAEMSE, National Association of EMS Educators and the AHA (American Hospital Association). “The result is an evidence-based simulation program that utilizes deliberate, repetitive practice to solidify student knowledge, reinforce patient safety and instill practices to improve patient outcomes,” McNett said. While they had used a GoPro Camera in the ambulance at the Sim Rally, the school utilizes the LearningSpace center management program from CAE, enhancing their ability to review learning outcomes, debrief and assess individual performance. McNett confirmed that working with CAE in the medical simulation center and at the Sim Rally offered the best possible scenario for them. “CAE Healthcare has been with us every step of the way on our journey,” McNett said.